Depending on the moment of harvest and ripeness of the olives, there are two flavors of olive oil: "Frutado - fruity" and "Dulce - Sweet". 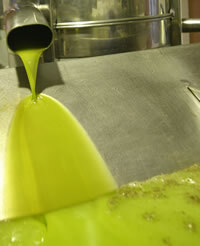 Fruity olive oil comes from the early harvest, the olive is still green and continue to ripen in the basket. This is done in late October. From the first olives, the oil is green to green-yellow coloured, it has a fruity flavour, almond aroma and a slight bitter component. Sweet olive oil is pressed from the black olives, they remain until November / December on the tree. From black olives, harvested late, the oil is golden yellow, the aroma is sweet and it has a slight piquancy. 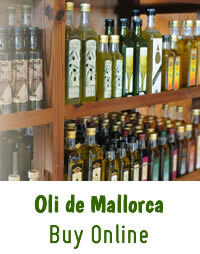 Olive oil from Majorca "Oli de Mallorca" is an extra virgin, cold-pressed olive oil, which was prepared from the olive varieties Mallorquina, Arbequina or Picual. 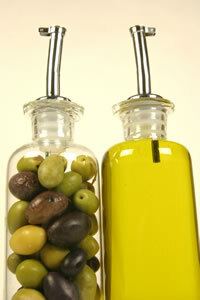 Extra Virgin Olive Oil category is pure, natural olive juice. 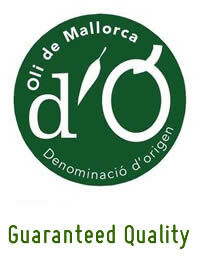 It is a fine olive oil from the first pressing, made with the highest quality olives. This olive oil has lots of flavour and a fruity taste. The olives are harvested by hand and pressed within 24 hours of harvesting. The oil production is done mechanically, but there is not chemical processes. The oil is not heated and no plasticizers are added. Refined olive oil is not recommended. The mixture is heated during the manufacturing process or processed by chemical solvents. This oil is done by a mechanical manufacturing process, refined oil is cheaper, more durable, and the cooking point is higher. However, it has a neutral taste but it doesn't contain valuable minerals or vitamins.